A vision. A company. A calling. Pantheon Steel is a book with many chapters, some closed, and some still to be written. As the pages turn, its voice is getting clearer, stronger, and more confident. Pantheon Steel was born in 2004 with the vision of 20-something steelpan maker and artisan Kyle Cox. At its inception, Kyle crafted traditional steelpan instruments, also known as steel drums. However, both his vision and company would dramatically evolve as he became inspired by others and discovered new ways to create the sound experience he was looking for. In 2005, one of those inspirations arrived in the form of engineer Jim Dusin. After 54 years working in manufacturing, Jim partnered with Kyle to quietly reinvent the manufacture of traditional steelpans with a new forming method, which they would later patent. With the passing of his mother in 2006, Kyle had a vision to create an instrument suitable for meditation and contemplation in tribute to her. But how would he do it? It took over a year for the answer to come. In July 2007, musician, actor, and filmmaker Kim Riccelli from California called Kyle, and boldly encouraged him to begin making a hand played steel drum, akin to an innovative new instrument from Switzerland. After pondering Kim’s idea over several days, Kyle was left with the unshakeable impression that he had been given his answer. Taking his vision for the steelpan into this new form would serve as the tribute to his mother he had been searching for. Thus he received a call, and the calling was accepted. Pantheon Steel had found its mission. 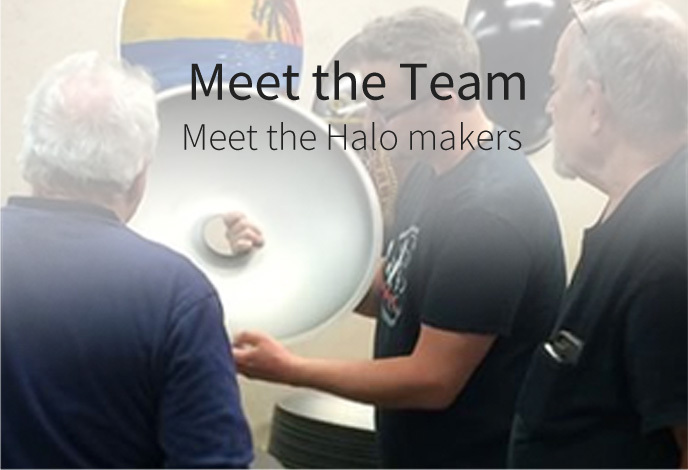 Together, Kyle and Jim created the Halo, a handpan instrument inspired by the sound sculpture invented in Switzerland, the steelpan from Trinidad & Tobago, and Kyle’s own unique understanding of what his instruments could and should have as a voice. They modified their equipment to handle steel sheets, rather than steel drum barrels–and a new instrument was born. Jim had initially been inspired by watching Kyle hand craft steelpans, and later was able to take Kyle’s innovative design ideas, and make them reality. 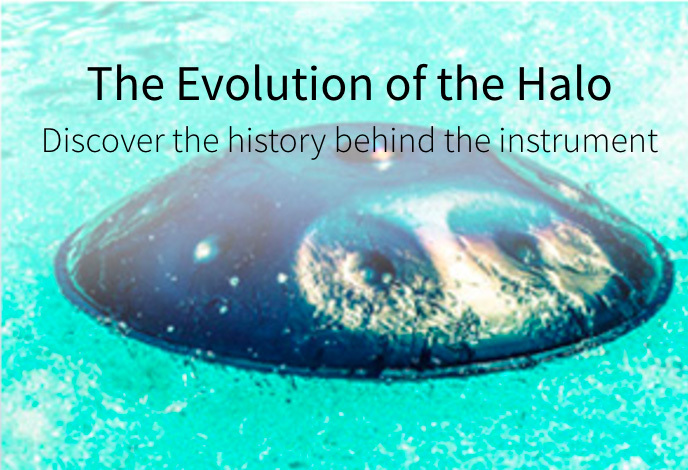 He found a new challenge to channel his creativity by inventing machines and processes to create the Halo. The goal was to gauge interest in the community to see whether a new company, Pantheon Steel, should consider making its own. Click the screenshot above to enlarge. The response was incredibly positive, as hundreds of emails poured in inquiring about the possibility of a new instrument, a hand-played steelpan, or “handpan.” The Halo didn’t exist yet, but the world yearned for it and its future siblings. Soon afterwards – and without the knowledge of Pantheon Steel – a passionate user post made it to the online forum at hang-music.org. It said that Pantheon was considering making a new instrument, and suggested the community to “please encourage them” to do so. Encourage, they did. Pantheon’s inbox was soon overwhelmingly flooded with excitement at the prospect. It was undeniable to Kyle that this was the way forward for Pantheon. Kyle wanted to create a voice for the Halo that stood on its own, and persevered to take the time needed to do so. 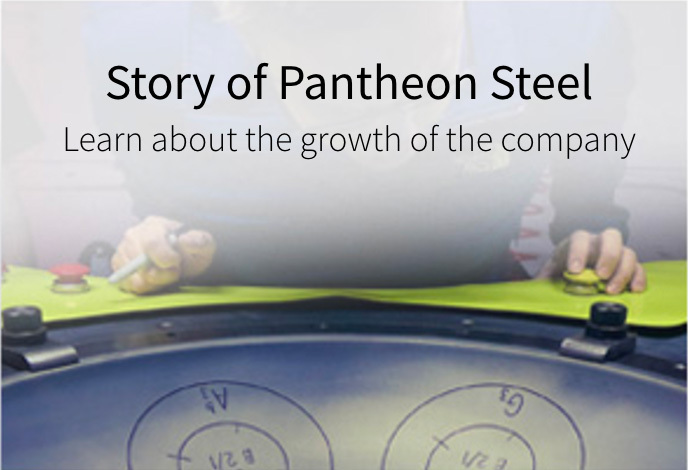 It took two years, from 2007 to 2009, for Pantheon Steel to develop the first Halo. In the Spring of 2009, Pantheon closed one chapter by delivering its last steel drum. In that same week, with a waiting list of nearly 2,000 people, the company began a new chapter as they delivered their very first Halo, thus fully committing to the promise of the new instrument. In doing so, Pantheon Steel became the first handpan maker in the United States, and arguably the second maker in the world. Pantheon Steel did not invent the art form, but they did launch the handpan making industry by actively supporting and equipping other handpan makers to emerge. Pantheon was and still is a believer in, and advocate for, other makers to actively explore the creative possibilities within this whole new class of instruments. From 2007 to 2016, Kyle and Jim grew Pantheon to become one of the premier handpan makers on the planet. The Halo quickly developed a passionate community of customers and fans. Since Jim’s passing in 2016, Pantheon Steel is carrying on his legacy, and tradition of excellence, by continuing to innovate. 2017 brings a new era of Halo, with new inspirations.